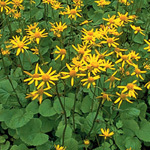 Pussytoes makes a nice ground cover for dry, open, shady areas. The common name comes from the flowers' resemblance to the toes/pads on cat paws. It is dioecious; this means that the male and female flowers are on separate plants and you'll need both in order to get viable seed. 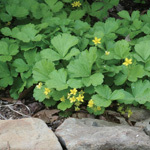 However, pussytoes spreads by short stolons (specialized shoots that let a single plant spread to form a colony--think of strawberry runners) and doesn't rely solely on seed for reproduction. 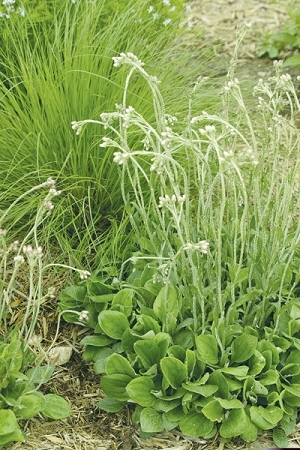 Pussytoes makes a nice filler in container gardens. Sometimes you can find black caterpillars with black spines and white spots on pussytoes. This is the butterfly larva of the American Painted Lady which can be found throughout Missouri from March through November. Q: I was interested in ordering some A. parlinii seeds but wanted to know how many come in a packet, and I was planning to plant some seeds outside immediately, but also wanted to start some seeds inside and plant the seedlings next spring. Do I need to stratify? A: There will be at least 200 seeds in the packet. I think a 2 to 4 week stratification period will increase germination. The seeds are tiny and don't need to be buried in the soil; just sow them on the surface.